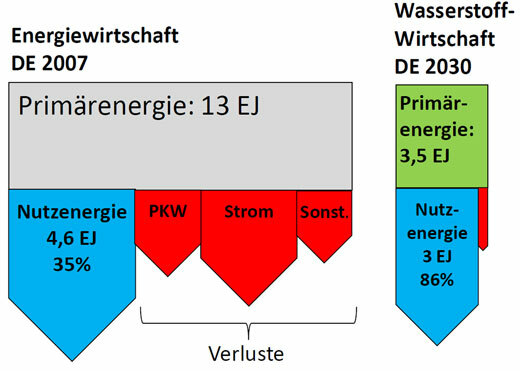 From a lengthy article in German advocating a hydrogen energy economy in 2030. Losses (“Verluste” ) in red. Quantity labels (absolute/percentage) not used consistently on all arrows. Could also be presented as pie charts, but author opted to do a simple breakdown using Sankey-style arrows. 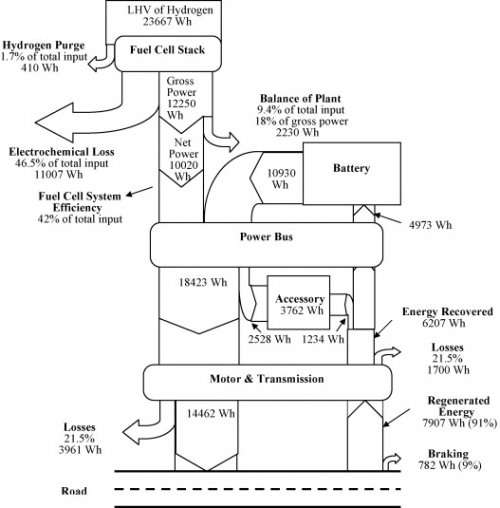 From a project summary on the webpage of the Fuel Cell Research Lab at University of Delaware’s Department of Mechanical Engineering comes this Sankey diagram. This is for a bus operating on the University of Delaware campus. The Sankey diagram shows energy flow and losses in the hybrid power train for a typical drive cycle. Unit is Wh, percentages are given in the labels as additional information. Energy is recovered when braking and is fed back to the battery (see upstream arrow ‘Energy Recovery’). Simple black and white diagram with a top-down orientation. The only extra that does not serve to carry information is the schematic road figuring at the bottom…. The below Sankey diagram is shown on a webpage of HAW University of Applied Sciences. It shows the generation path of hydrogen from natural gas, and the overall energy yield. Unfortunately the diagram is too small to grasp the details. The Sankey arrows represent energy content. Losses are shown as black arrows. This seems to have been the result of a study project dealing with a fuel cell driven boat (ZEMSHIPS).